Since 2011, The Niello Company’s Drive to Give holiday program has donated over ten tons of non-perishable food and thousands of general needs items to the local community in which they do business. Every year since its inception, the program has grown in both size and scope, and 2015 was no different. Partnering with the local organization, People Reaching Out, The Niello Company collected specific general needs items for local school children and their families. Backpacks, toothbrushes, blankets, coloring books and socks were accepted at all 14 Niello dealerships throughout the Sacramento area. In addition to these items, The Niello Company also bought gifts for over 70 school-aged children who otherwise wouldn’t have a gift to open that holiday season. 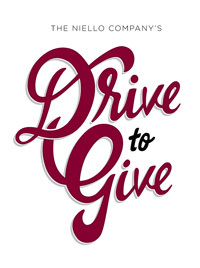 The Niello Company’s Drive to Give Program has a direct, and positive impact, on the lives of so many local families and children. To find out more about this program and how you can be involved, please contact the Marketing Department of The Niello Company at 916.643.7300. Sacramento Food Bank & Family Services is a local, non-profit agency committed to serving individuals and families in need. With a staff of 42 and a volunteer force of over 5,400, Sacramento Food Bank & Family Services provides free emergency goods and services to 30,000 unduplicated men, women and children each month. As a dedicated non-profit, our mission is to provide essential resources to overcome the many faces of hunger and human need. Our goal is to provide food security, so our community isn’t a hungry community. We serve as the primary food collection and distribution center for hunger-relief efforts in our area, distributing fresh and non-perishable food to the hungry through our network of more than 60 local hunger-relief and charitable organizations. We are dedicated to feeding the hungry through our network of partner agencies, educating the community about hunger and advocating for hunger relief. The Food Bank of Contra Costa and Solano has been serving the community for over 35 years. The Food Bank serves approximately 149,000 hungry people in need every month at community sites and through a network of 180 charitable agencies, and distributed over 18 million pounds last year. The Leukemia & Lymphoma Society is the world's largest voluntary health organization dedicated to funding blood cancer research, education and patient services. LLS's mission: Cure leukemia, lymphoma, Hodgkin's disease and myeloma, and improve the quality of life of patients and their families. The mission of the Museum is to promote an awareness of and enthusiasm for human experience through art. The Museum fulfills its mission by offering a variety of education programs for youth & family, schools & teachers and the public. Sisters Mary Anne Bonpane & Stephana O’Leary started Wind Youth Services as a daytime safe haven for homeless teenagers to seek refuge and receive survival services. As the awareness of the children’s needs grew so did the services provided - broadening to provide programs that would offer tools and resources to teens to help develop the necessary skills to break the cycle of homelessness. Ride To Walks's mission is to enhance the lives of children and young adults with neurological disabilities by providing innovative therapeutic horseback riding activities that are recreational in nature and adapted to the individual's needs and abilities. Ride To Walk's strives to provide a positive support system for individuals with disabilities, their parents/caregivers, and our community. The American Heart Association is a national voluntary health agency whose mission is: Building healthier lives, free of cardiovascular diseases and stroke. The association's impact goal is, by 2020, to improve the cardiovascular health of all Americans by 20 percent while reducing deaths from cardiovascular diseases and stroke by 20 percent. Greater Sacramento is an organization created and led by regional CEOs to retain, attract, grow, and create sustainable businesses throughout the region’s six counties: El Dorado, Placer, Sacramento, Sutter, Yolo, and Yuba. California Musical Theatre is Northern California’s premiere producer and presenter of musical theatre – the largest nonprofit musical theatre in California. Since its inception in 1951 under an open-air, circus-style big top, the theatre has grown to become the most successful performing arts organization in California's heartland. The Sutter Medical Foundation is focused on improving the health of our communities. The core mission, values, and strategic planning principles of Sutter center on investing back into our communities to improve facilities, add services and care for those without health insurance. The mission of KVIE is to educate, enrich, enlighten and inspire diverse audiences and individuals with high quality television programming and related services that enhance the quality of life for people throughout Northern California. SacPAL is an organization made up of members of the Sacramento Police Department as well as Sacramento City Parks and Recreation Department and many community member volunteers helping the underserved youth of Sacramento. Its mission is to instill in our youth positive citizenship principles through quality educational, recreational and civic programs. The club was founded in 1962 and continues to represent the highest ideals through its service-oriented programs both at home and abroad. The club is active in the local and world community service projects around world. The mission of The Sacramento Metro Chamber is to foster regional economic prosperity, an undertaking sought since 1895 when the Metro Chamber was first established. The Metro Chamber is the region's leading business organization for promoting economic strength and serving as a unified voice of business throughout the six-county Sacramento region. March of Dimes is committed to improve the health of babies by preventing birth defects, premature birth, and infant mortality. This mission is carried out through research, community services, education and advocacy to save babies' lives. The mission of Jenna & Patrick’s Foundation of Hope is to support and promote research, find a cure or treatment for Cystinosis, and provide support to affected individuals and families. Serotonin Surge Charities is an all-volunteer non-profit organization founded in 1999 to raise money for health care related causes. Serotonin is the “good feeling” brain chemical and our mission is to make people feel great about using their time, talents, and wealth to help others in need. We aim to end hunger locally by providing fresh and healthy food to those who need it most. It’s about getting real food to real families. The Walter family has lost many loved ones to FTD. With this, each of the Walter brothers participated in ground breaking research at the National Institute of Health in Bethesda, MD and UC San Francisco. Now we work to honor their memory, hard work and efforts working to raise money for FTD/ALs research so that no more families need to be destroyed by this dreadful disease. The California Auto Museum includes antique & classic vehicles which are available to enhance your company party, anniversary, wedding, publicity campaign, or other special event. These vehicles can be utilized for photo opportunities or displayed as background decoration. All vehicles are fully licensed and insured, and come with a driver who will provide pre-event planning and coordination. The Make-A-Wish Foundation enriches the lives of children with life-threatening medical conditions through its wish-granting work. The Foundation's mission reflects the life-changing impact that a Make-A-Wish experience has on children, families, referral sources, donors, sponsors and entire communities. The organization has already reached more than 250,000 children around the world. The Sacramento Zoo inspires appreciation, respect and a connection with wildlife and nature through education, recreation and conservation. Sacramento Zoological Society, formed in 1957, assumed management of the Zoo in July 1997. Since its inception, the society has served as the fund-raising organization for the Zoo, providing funds for animal care, education and conservation programs. Shriners Hospitals for Children's mission: Provide the highest quality care to children with special healthcare needs within a compassionate, family-centered and collaborative care environment. Provide for the education of healthcare professionals. Conduct research to discover new knowledge that improves the quality of care and quality of life of children and families. Girl Scouts Heart of Central California serves more than 28,000 girls and nearly 10,000 volunteers in 18 counties. Girl Scouts builds girls of courage, confidence, and character, who make the world a better place. The council's goals give direction and a sense of unity, while providing a framework for all levels of planning. The Sacramento LGBT Community Center creates events, programs, and pathways to services that help lesbian, gay, bisexual, and transgender people feel welcome, needed and safe. We envision a Sacramento region where sexual orientation, and gender identity and expression (SOGIE) are recognized as a spectrum of valued personal characteristics, universally respected and affirmed. The Capital Cagers Wheelchair Sports Association is a local 501-(c) 3 nonprofit association that encourages people with disabilities to stay fit through recreation. We have been in existence since 1976 when the organization was formed to create a Wheelchair Basketball team that became part of the NWBA (National Wheelchair Basketball Association). The California Narcotic Officers' Association is a non-profit, corporation dedicated to providing high quality training for law enforcement professionals. Since 1964, CNOA has grown to become the largest non-profit Training Association in California, with over 7,000 members. Mustard Seed School helps meet the needs of homeless children, providing a safe, nurturing and structured environment, a positive learning experience, happy memories, survival resources of food, clothing and shelter referrals, medical and dental screenings, immunization updates, counseling for children and their parents, and assistance entering or reentering public schools. The California New Car Dealers Association is the country's largest state association of franchised new car and truck dealers. CNCDA members are primarily engaged in the retail sale and lease of new vehicles, automotive service, repair and part sales. CNCDA promotes fair and ethical business practices through a wide range of educational programs, services and industry publications. Our mission is to provide foster youth with Court Appointed Special Advocates and at-risk youth with dedicated mentors, creating a bridge between the most vulnerable in our community and caring volunteers who want to help. Kops-n-Kids partners with local, state & federal law enforcement agencies, local fire departments, educators and community volunteers to provide a week long summer day camp for boys and girls, giving them the opportunity to interact with positive role models, experience sports clinics and participate in gang resistance, violence prevention, gun avoidance and drug deterrence activities. Junior Achievement is a partnership between the business community, educators and volunteers working together to inspire young people to dream big and reach their potential. We teach financial literacy, entrepreneurship and workforce readiness to students in grades K-12. Working together, we can empower our next generation to own their economic success. UCP is an efficient nonprofit, top Sacramento charity and a great place to make a donation or attend events. Whether you donate to our programs or attend one of our events like our ‘80s Dance Party, golf charity event or our Humanitarian of the Year Award Dinner, you are changing lives. For nearly 150 years, Sacramento Children’s Home has led the way in assisting our region’s most vulnerable children and families. Through a spectrum of comprehensive residential and community programs, we systematically address family issues with a focus on ending the generational cycle of abuse and neglect and building strong families. The Coast Guard Foundation is a national nonprofit organization dedicated to enhancing the lives of the men and women of the Coast Guard and their families. Founded more than 40 years ago, the Coast Guard Foundation provides education, support and relief for the brave men and women, who enforce maritime law, protect our homeland and preserve the environment. The Sacramento Sheriff’s Activities League (SAL) is a juvenile gang and crime prevention program that relies on athletic and academic activities to develop a bond between law enforcement officers and the youth in our community. Our mission is to develop productive citizens, build character, and prevent crime. Let’s ROC 5k is organized by the Ovarian Cancer Education & Research Network, Inc. The mission of OCERN is to advocate for research for the early detection, treatment and cure of ovarian cancer. We promote ovarian cancer education in our communities and will provide a network of resources and support for women and their families. The San Juan Education Foundation believes inspired and innovative teaching better prepares students for success. By providing funds for teacher-driven learning projects where public funding falls short, the foundation rewards initiative and creativity and helps ensure that children are not denied critical learning opportunities. The mission of the Boys and Girls Club is to enable all young people, especially those who need us most, to reach their full potential as productive, caring, responsible citizens. The Rotary Club of Sacramento, organized August 20, 1913 by a committee of Rotarians from San Francisco and Oakland, is one of the oldest service groups in the Sacramento region. The club charter was granted February 1, 1914, making it the 97th club in the world of Rotary International. The Sacramento Kings are an NBA basketball team that have played in front of the Sacramento community’s most devoted and closely knit basketball fans for many years. Locals of Sacramento have been brought together by their loyalty for their home team for years, and going to games remains a traditional pastime for many generations. The River Cats are Sacramento’s home minor league baseball team. With America’s favorite past time right in Sacramentans’ own backyard, the River Cats have wedged their way into the hearts and loyalties of the community who enthusiastically come out to support their home team. Sacramento Republic is Sacramento’s first ever FC soccer team. The team was founded in 2012 and made its debut in the United Soccer League in 2014. The team was formed by soccer enthusiasts in the community and has already developed a large fan base. The CHP actively works to protect the roads and highways throughout the state and to reduce collision and fatality rates in California. CHP has many programs in place to help promote safety and communication between California’s diverse residents and the CHP. The Mission of the Sacramento Asian Peace Officers Association is to work collaboratively with all law enforcement organizations and various community groups for the promotion and advancement of Asian/Pacific Islanders within the law enforcement profession. We are Sacramento’s only four-year comprehensive university, offering unparalleled opportunities for students to learn, live and succeed. The El Dorado Hills Chamber of Commerce is a nonprofit membership organization that works with local businesses to improve the region's economy and business environment; and strives to provide leadership, advocacy and support for our members. Wake the World is a non-profit organization and group of boat owners providing watersports opportunities to abandoned, abused and neglected children, as well as for the handicapped and our wounded warriors. Young people who participate in our afterschool and community programs master the tools they need to become critical thinkers and problem solvers for creative, realistic solutions. They demonstrate measurable achievement in their individual ability to increase academic performance, advocate for community change and, engage their civic interests. The mission at Brighter Beginnings, to support healthy births and successful development of children by partnering with parents and helping to build strong communities, gains its strength and aspiration from the core belief and vision that every family matters, and every child deserves a happy, healthy future.